Texas & Tennessee plays classic bluegrass music in a passionate style intended to honor the artists who helped define the genre from the 1950s through the 1980s. 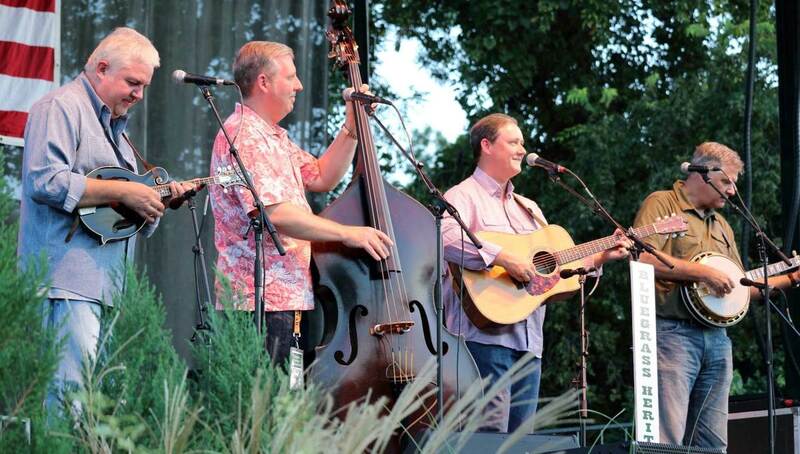 Each member of the band has a deep love and respect for the music of Flatt & Scruggs and the Foggy Mountain Boys, J. D. Crowe & The New South, and the Bluegrass Album Band, and their enthusiasm for the music is quickly conveyed to the audience. The band features songs that nearly all long-time bluegrass fans will recognize (and maybe sing along with) and that casual bluegrass fans will want to hear again. John R. Bowman’s strong lead vocals are a highlight of each set, and the brilliantly explosive breaks by Steve Huber and Ron Inscore are supported by driving bass from Alan Tompkins. The next time you have the chance to enjoy Texas & Tennessee, get up close. They don’t get out to play very often, and it’s an experience that you won’t want to miss. 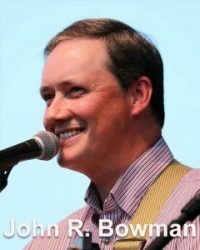 John R. Bowman has an impressive history as a musician, singer, and preacher. He began his career as a professional musician with Doyle Lawson & Quicksilver in 1991 and toured with him for nearly two years Next he teamed up with the legendary Alison Krauss & Union Station where he spent a year playing and singing. In 1994, John joined The Isaacs and spent 12 years traveling the world as a vocalist and multi-instrumentalist. In 1997, he answered the call to preach and continues to preach and sing in services and revivals to this day. John was a guitarist for the Gaither Vocal Band and Gaither Homecoming Tour, along with The Isaacs, in 2005. While also teaching at a Christian school in Tennessee, John played and sang with the legendary J. D. Crowe & The New South from 2007-2009. In 2009, John joined up with Adam Steffey, Ron Stewart, Keith Garrett, and Harold Nixon to form The Boxcars. Together they recorded three albums and earned a GRAMMY nomination. John recorded a tribute to his father-in-law, Joe Isaacs, in 2010, and the album was nominated for a Dove award. His recent solo album, Beautiful Ashes, was also nominated for a Dove. 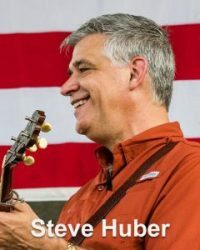 Steve Huber has been widely recognized as a world-class bluegrass banjo player since his college years when he toured with The Paisleys and Paul Adkins. After earning a degree in mechanical engineering and gaining extensive experience as a machinist, Steve moved to Nashville to work in George Gruhn’s repair shop. His work with Gruhn enabled him to spend a great deal of time playing and studying the qualities and attributes of pre-1942 flathead Gibson banjos. In 1996, he put his studies to work and began manufacturing the Huber Vintage Flathead banjo tone ring. A few years later, he began producing the first Huber Banjos. These banjos are some of the most highly sought-after instruments on the market today. Since moving to Nashville, Steve has continued his work as a professional banjo player while running the Huber Banjo Company during the week. Steve spent several years touring with the award-winning Kenny & Amanda Smith Band (with his Texas & Tennessee brother Ron Inscore on mandolin) until the birth of his daughter Katie prompted him to retire from “road life” in 2005. A native of Ararat, Virginia, mandolin player and harmony vocalist Ron Inscore is deeply rooted in traditional bluegrass music and has been playing mandolin and guitar since the age of 8. Ron started playing music as part of a duet with his cousin, Texas & Tennessee brother John R. Bowman, by playing at churches and other local events. Late in the 1980s, Ron became a part of the award-winning band Appalachian Trail and played with them for several years. He later joined forces with Shannon Slaughter to form Savannah Road. After that, he headed out on the road (and into the studio) with the Kenny & Amanda Smith Band (with Steve Huber on banjo) for a three-year run. Even though he doesn’t spend all his time touring and recording as a musician, his talents bring him opportunities to sit in with bands such as Mountain Heart and The Boxcars. He again teamed up with Shannon Slaughter and his wife, Heather, to form Shannon Slaughter & County Clare in 2010, and continues playing with them to this day. Ron is an avid history buff who enjoys life, and especially fishing, on the family farm in Ararat with his wife Tonya. Kentucky native Alan Tompkins sings, plays bass and banjo, and is the founder of the Bluegrass Heritage Foundation. His love of music began as a teenager when he started playing southern gospel and country music. In 2010, with the City of Farmers Branch, Texas, Alan created the Bloomin’ Bluegrass Festival, the largest bluegrass event in north Texas. It was nominated for the IBMA Bluegrass Event of the Year Award in 2014 and 2017. 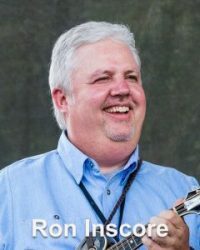 He holds a Bluegrass & Traditional Studio Artist Diploma from the Kentucky School of Bluegrass & Traditional Music and is an IBMA Leadership Bluegrass graduate. 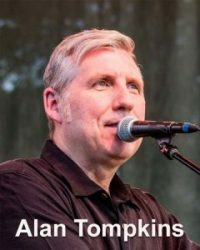 Alan received the IBMA Momentum Award for Industry Involvement in 2015, was nominated for IBMA’s Bluegrass Broadcaster of the Year Award in 2016 and 2017, and serves on the board of directors of IBMA and the IBMA Foundation. His solo album, No Part of Nothin’, was released in 2012. When he’s not playing, Alan is Vice President & General Counsel of Unity Hunt, Inc. where he manages legal matters for the Lamar Hunt family. He’s licensed as an attorney and CPA in Texas and holds an MBA from SMU.